I sometimes feel at the beginning of something new both apprehention and excitement. These two emotions combined can be a bit paralyzing. I eventually jump but sometimes I lay on my bed and stare at the ceiling for a few days before jumping. This blog has been that for me, a lot of staring at the ceiling and wondering if i should jump. 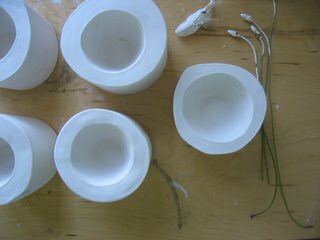 Yesterday I spent the entire day making molds for cups. I am excited to have these made after staring at the ceiling for a long time thinking about making them. They are finally finished and I am feeling proud. I love plaster molds. The plain white forms, many of them stacked, are so satisfying to look at. Mold making is something of a challenge for me. I usually hire out the task to a professional if it is a complicated form. The simple ones I make myself. I have had some real disasters making molds, five gallons of wet plaster breaking through the coddles all over my studio floor, oh my, it is a wonder I go back to it. I am starting to get better at it, you know practice makes perfect or semi perfect. I am gonna go and stare at them now.